Santa Claus, Father Christmas, St. Nicholas, St. Nick, Father Frost, a thousand names for one loving soul. No matter what he looks like, or what language he speaks we, as the people of the world, know what he is- the best of mankind. All the Joy, Happiness, Love, Kindness, Giving, Benevolence, Humanity, and Compassion are embodied in Santa. He appears slightly different in each person’s mind- so every way we see him is just perfect and this Hand cut and delicately hand painted Santa is no different. ‘Bountiful Santa Claus’ is a One of a Kind handmade figure which stands a magnificent 22 inches tall (almost 2 full feet!) and is perfectly balanced on his 14” by 7 ½” base. He and his base have been cut from ¾“ thick forest managed pine. Santa is dressed in a rich, fur trimmed, deep, red robe. His pockets and sleeves are bedecked with cream and sage harlequin ‘fabric’. His arms, pockets, and wagon are overflowing with the luscious fruits of the fall harvest- gourds, corn, grapes, squash, apples, hay, and of course, pumpkins. Santa has two very traditional Christmas trees decorated with vintage décor- apples, oranges, popcorn, and cranberries. Even the back of the piece has been detailed with his hat and pumpkins. His base is decorated with autumn and winter foliage on faux finish black marble and edged in antique gold. 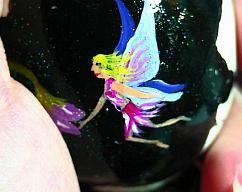 It has a dusting of gold shimmer nad irridecent glitter. Finally Santa and his base has been finished in antique crackle finish and then varnished to protect him for generations of Christmas Celebrations. Leave this beautiful Santa out for Autumn and all of Winter- he is a classic! 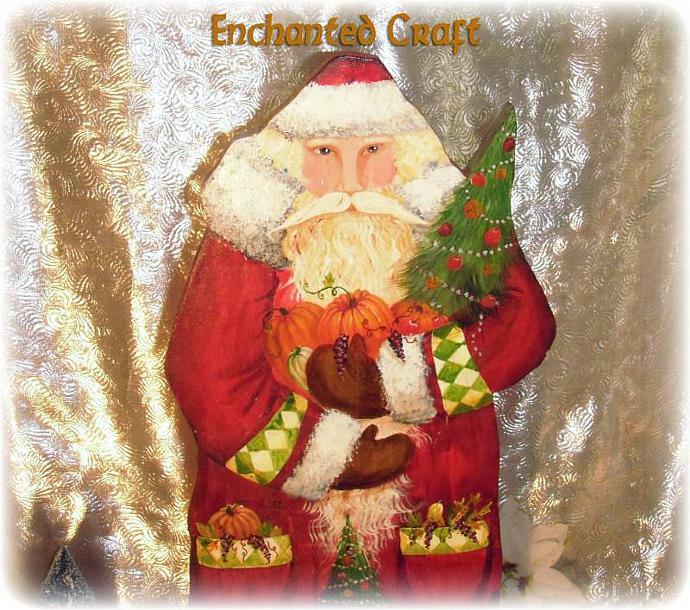 Because this Santa has been handmade and hand painted he is truly OOAK (one of a kind). I loved painting him and I would never be able to reproduce his warmth again. If you would like a OOAK Santa specific in color or style please contact me- it takes almost 2 weeks of work to get one of these figures perfect.